This weeks blog is more visual than verbal, since the short video below really paints the picture better than words will describe (at least given my narrative skills). 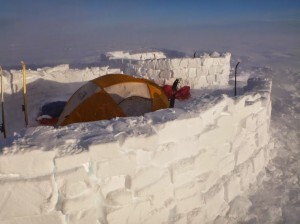 The clip is a compilation of the changing weather conditions, showing the calm before the storm after spending over half a day fortifying our camp in preparation of what was to come, followed by the first signs of the storm, and ending with footage of what it was like being outside whilst in the heart of the piteraq enduring hurricane force winds. Again, any questions or comments… don't be shy, say hi! The first photo was taken before the piteraq after spending over half a day fortifying our camp, with the main tent facing the storm protected by a double snow wall. 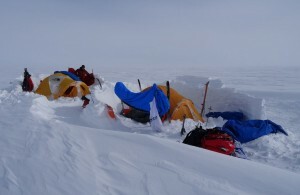 The second photo was taken two days later in the morning after clearing up the camp. Whouâ, the Piteraq ! And the big walls around the tents !